We offer customers Heat Shrinkable Low Voltage Terminations that are used in PVC/XLPE/PILC Cables of up to 3.3 KV applications. 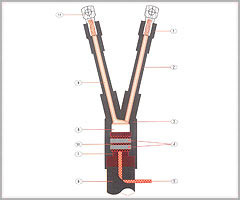 These are made available with Cable Components comprising Outer Sheath, Armour, Inner Sheath and Cable Insulation. Further, the kit components include H. S. Terminal Sleeve, Insulation Sleeve, H. S. Cable Breakout, Jubilee Clamp, Tinned Copper Braid, 1Black Mastic Sealant Tape and Terminal Lug. For ensuring in them optimum functionality standards, these are also made to undergo Electrical Performance Tests comprising AC Voltage Withstand 3.5 G/ 5 Minute (5KV / 5 Minute) and DC Voltage Withstand of 15 KV / 15 Minute (20 KV / 15 Minute). With all kits supplied with full kit contents so as to successfully make a L V Termination, the cable size offered include 4x16 – 35, 4x50-95, 4x 120 -185, 4 x 225 -300 (all in sq mts). 1. H. S. Terminal Sleeve 4 Nos. 2. Insulation Sleeve 4 Nos. 3. H. S. Cable Breakout 1 No. 4. Jubilee Clamp 1 No. 5. Tinned Copper Braid 1 No. 10. Black Mastic Sealant Tape 1 Roll. Installation Instruction Manual 1 No. All kits are supplied with full kit contents for making a L V Terminations. Yamuna Infra & Technology Pvt. Ltd (Yamuna Rubber Industries) along with its USSEAL trademark stands leader Pan-India and globally, specifically for its high qualitative standards, superior technological advantage, durability and constant focus on customer satisfaction. We have achieved excellent internationally acclaimed qualitative parameter, ensuring that client specification, and internationally approved stringent quality measures are adhered to at all stages of the manufacturing process. We have been able to provide a wide range of highly customized products in order to suit a wide array of utilities required in the niche industry of power cables and power cable accessories. Yamuna Infra & Technology Pvt. Ltd (Yamuna Rubber Industries) is justifiably proud of its achievements in the past, but we are also committed to the future to ensure that we remain synonymous with quality & innovation, throughout the worldwide electrical distribution industry. With extensive experience in manufacturing power cable accessories, we have the ability to work with customers at all levels to offer them most effective solutions adapted to comply with National & Inter-National quality standards for meeting specific needs as specified by our large band of satisfied customers. We have state of the art in-house design facilities which guarantee the performance of our systems and products including security and integrity of the applications, we provide for. Our people are driven by our customer's needs, meeting the challenge of developing innovative technologies and creating market specific products and services year after year.